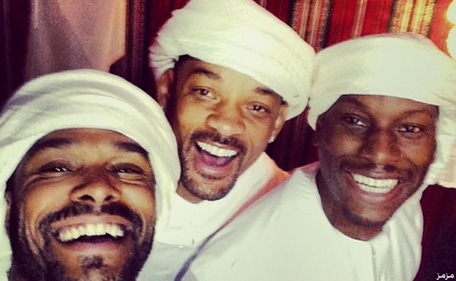 From desert camps to super-yachts, Will Smith, Tyrese and Maxwell live up the Dubai high life. 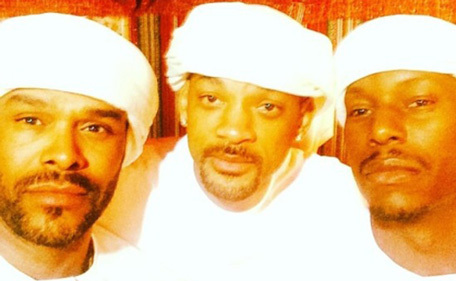 Will Smith got ‘Jiggy Wit It’. 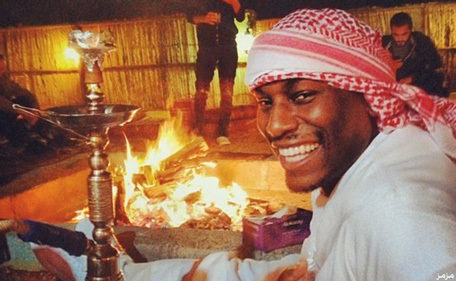 Tyrese hopped aboard a super-yacht. While Maxwell came to the party riding a camel, true Bedouin style. If this reads like a bad spoof of ‘Lawrence of Arabia’, then you couldn’t be more further from the truth. The above-mentioned script is the curious case of three Hollywood celebrities who decided to party it up in Dubai, embracing the spirit of true Arabian hospitality. Oh, and Will’s wife Jada Pinkett-Smith provided the required supervision to ensure these bad boys don’t get into too much trouble while painting the place red with their antics. This past week, this celebrity quartet has been partying hard as it rang in Tyrese’s birthday on December 30th, followed by the Smiths’ anniversary the day after, and the NYE celebrations that refuse to end. While the ‘Fast and Furious’ actor rang in his birthday at The Act, Shangri-La Hotel on December 29, with musician and close friend Maxwell by his side, the week has been one big party with the Smiths joining in to serenade the 35-year-old with a ‘Happy Birthday’ song over a birthday meal. The Smiths, who are also celebrating their 16th wedding anniversary, got the courtesy back in spades, as Tyrese and Maxwell hit the piano to sing for the happy couple, which also reunited with Will’s close mate and former singing buddy, DJ Jazzy Jeff from his Fresh Prince days. In fact, the Smiths decided to forgo the NYE celebrations with Tyrese and Maxwell to support Jeff, as he performed on December 31st at the Barasti Beach bar at the Le Meridien Mina Seyahi. Ticket holders at the NYE party were in for a special treat when Smithy jumped up on stage at the stroke of midnight to sing ‘Getting’ Jiggy Wit It’, bringing the crowd to its feet. 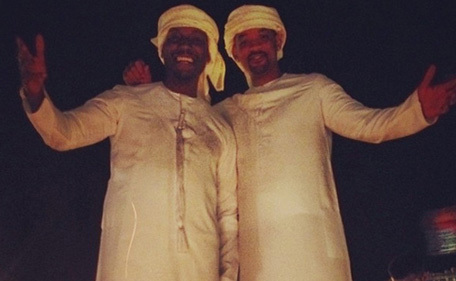 Tyrese, who has peppered his Instagram account and Twitter timeline, with his party tweets, found time with Maxwell to visit Burj Khalifa, hop aboard a super-yacht to smoke a Cuban and head off on a desert safari with the Smiths in tow – complete in a white dishdasha and headgear. And did the city return the love, you may wonder?